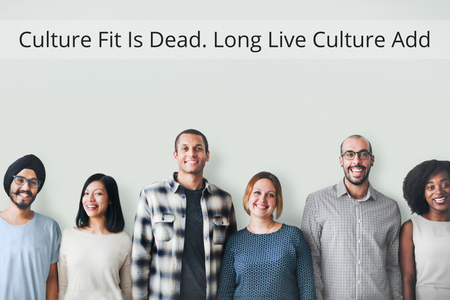 The words ‘Culture Fit’ are bandied about a lot in recruitment. Organisations when hiring, look for people who might share their overall vision, mission, and values and that is understandable and not surprising. They have found a formula that seems to work and they want to continue the success by employing people who fit neatly into the tried and tested mould. The problem comes when hiring for ‘Culture Fit’ gets in the way of hiring for diversity. Making the assumption that people who don’t look or act like existing employees can’t work with an organization, is dangerously complacent, showing a lack of innovation, and can ultimately erode the growth trajectory that was hoped and planned for. Now there is a new term that should be considered in today’s fast moving corporate world – ‘Culture Add’. Everyone wants employees who work hard, get on well with others and contribute to the company success, but the danger of hiring for those qualities is that they can easily be confused with people with similar attitudes and background to those employees already in place. Instead, you could hire people who think differently, who challenge the status quo and bring different life experiences to the employee mix. Hiring people who add to the culture, rather than fit in with it can shake up a stale, uniform employee type and bring fresh innovative ideas with them that might just enable you to get that competitive edge over others. The ‘Culture Add’ approach shapes the culture and allows for it to evolve and adapt over time. We have all grown up with disruptive technologies like television, the internet and the mobile phone and we now have disruptive work models such as Uber, Netflix and Spotify that seem to be taking over, so why not have a few disruptive employees to add to that corporate mix? We’re not talking troublemakers or uncooperative difficult individuals, but people who are passionate about the company they’re joining and want to contribute their unique worth. Their experience enables them to see things differently and can perhaps come up with solutions or ideas that might never have occurred to the employees that fit the well-worn stereotype of the perfect fit. Some companies have taken this one step further when they run ‘hackathons’ where staff from all departments get together to collaborate and thrash out new ideas. The theory is that if you put people with very different skills and experience in a collaborative, relaxed setting, they will come up with ideas that could be revolutionary and would never have been thought of through traditional channels. These hackathons were started by IT firms but there have been a number of well-publicised hackathons in government, NASA, health charities, gaming and transport systems. This is the ‘Culture Add’ concept taken to the next level and can have enormous benefits, not only producing new products and services but also contributing to employee engagement levels and social cohesion. So, how do you go about recruiting for and embracing individuals who could add to the company culture in a positive way? There are three places to start – the existing employees, the employer brand and managing the culture change with training and internal communications. Those employees who are used to the way things work and are comfortable with the status quo need to understand that introducing a new team member who may not be exactly like them is a good thing and not an alienating experience. When collaboration is encouraged within diverse teams and success is celebrated, those employees who fit the culture won’t be threatened by those who add to it as they can see for themselves that it works. The recent film, Hidden Figures, a true story about how a few brilliant African-American women who worked at NASA, became the brains behind the launch of astronaut John Glenn into orbit. They crossed all gender and race lines to be accepted and then celebrated by NASA and America itself. The existing employees were extremely resistant and hostile to the women who faced a huge battle to be recognised and respected for their talents. They didn’t fit the culture of NASA but they most certainly added to it. This is a story from the 1960’s but sadly there is still similar resistance to difference in today’s workforce. Does your employer brand encourage or alienate people from diverse backgrounds? Do they see a brand that only recruits from the same universities and wants people with the same experience and skills? Or do they see a brand that actively encourages difference, innovative spirit and originality? Helping employees and recruiters understand how to embrace the change to a ‘Culture Add’ approach will reap rewards in the long run as the company benefits, not just adding to the culture but to the bottom line as well. An added bonus from this approach is that if you are actively looking for difference rather than similarity, there is little danger of falling into the unconscious bias trap. Ericsson underwent a huge change when it transformed into an ICT and a Software/Services company from a telecommunications company last year. They changed their employer brand to You + Ericsson, to stay relevant in the marketplace during its transformation. Their phrase, ‘Your talent + our resources. Your ambition + our vision. Your imagination + our innovation’ is a simple and powerful message to prospective candidates. Is ‘Culture Add’ right for everyone? What about deeply traditional, some might say stuffy companies? Would this work for them? Surely this is for the new start up culture, not for the City or professional services? It is an intriguing question but one that is worth exploring for all types of organisation. Many City firms are actually at the cutting edge of innovative employer branding and are already embracing ‘Culture Add’ as a successful concept. In The Sunday Times Best 100 Companies to work for, there are many professional and financial services firms in the list, some previously regarded as being very traditional in their approach to culture fit. They are unlikely to be on the list if they are employing an outmoded employer brand and insisting new employees fit the existing traditional culture. They were also some of the first organisations to trial name blind job applications to prevent unconscious bias. Ditch the Fit and look for the Add? Many organisations who have tried the ‘Culture Add ‘ model would say yes. Attracting a diverse workforce and seeing what they can bring to the table rather than asking them to turn up to work and do as everyone else does is the workplace of the future, enabling a successful, robust and competitive corporate structure that will stand the test of time.